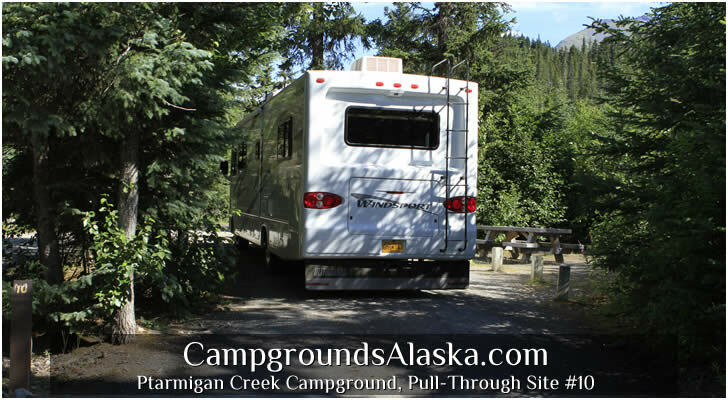 Ptarmigan Creek Campground on the Seward Highway in Alaska should be noted that large motorhomes and trailers are not recommended. Campsites are untypically short and the corners are tight. We suggest that larger or longer RV look to Trail River Campground just up the road. 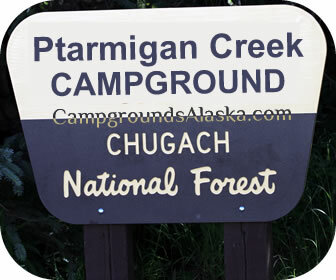 Ptarmigan Creek Campground is located at Milepost 23 along the Seward Highway on the Kenai Peninsula. Ptarmigan Creek is a popular campsite with smaller rigs and tent campers that also is maintained by the U.S. Fish and Wildlife Service. Ptarmigan Creek Campground offers hiking, fishing and a fish viewing platform. Directions - Travel south on the Seward Highway from Anchorage for a distance of approximately 100 miles to Crown Point. The turnoff for Ptarmigan Creek Campground is just before the Ptarmigan Creek bridge. Description - A small secluded campground along Ptarmigan Creek and the starting point for the hiking trail to Ptarmigan Lake. Sewer - Located nearby at Trail River Campground on Kenai Lake. Max Length - Two pull through sites can handle up to 70 feet but the access is tight. Most campsites are back-in sites limited to around 25 feet max. Additional Amenities - Tables, Fire Pits, Hiking Trails, Water Well with hand pump. As you click through this section one immediately sees a vast assortment of road accessible campgrounds throughout the Kenai Peninsula. Sites can be reserved through recreation.gov. A quick word about camping fees - America The Beautiful, Federal Interagency Senior Pass and the Access Passes (For U.S. citizens or permanent residents with permanent disabilities) reduce camping fees by up to 50% in many of the Kenai Peninsula campgrounds maintained through the National Parks, U.S.Forest Service and US Fish & Wildlife Service. NOTE: Throughout the National Parks, U.S.Forest Service and US Fish & Wildlife Service campgrounds, pets are required to be on a leash no longer than nine feet at all times. Owners must be in control of pets at all times and must clean up pet waste. Please help us protect the right to bring our pets along on camping and outdoor trips.